In a classic case of do as I say and not as I do, superstar Leonardo DiCaprio, who is scheduled to talk about conservation at the State Department’s Our Ocean conference Tuesday morning, is reported to have borrowed one of the world’s largest super yachts in order to watch the World Cup in Brazil and party in style. DiCaprio, who became an instant global heartthrob for his role on the mega hit movie Titanic, is also known for his environmental activism. DiCaprio, who recently starred in The Wolf of Wall Street, was invited by Secretary of State John Kerry to speak at the conference, which is said to be attended by senior government officials, renowned scientists and other environmental advocates. According to Kerry, DiCaprio has demonstrated continued dedication towards protecting the world’s oceans. The Leonardo DiCaprio Foundation recently awarded the advocacy group Oceana a $3 million grant to protect the ocean habitat and vital marine species. Leo DiCaprio is lending his powerful voice to our call to action to work together to protect the world’s ocean. DiCaprio, who will be introduced by Secretary Kerry, will speak after a short video message from President Barack Obama. The hero of many global hits including The Great Gatsby, DiCaprio has repeatedly said that global warming is the top environmental challenge faced by humanity today and people have to do their part in promoting a sustainable environmental future for our planet. Yet, as he prepares for his presentation at the Ocean Conference, DiCaprio is said to have rented the Topaz, a 482-foot super yacht with an equally large carbon footprint, while staying in Brazil for the World Cup football tournament. 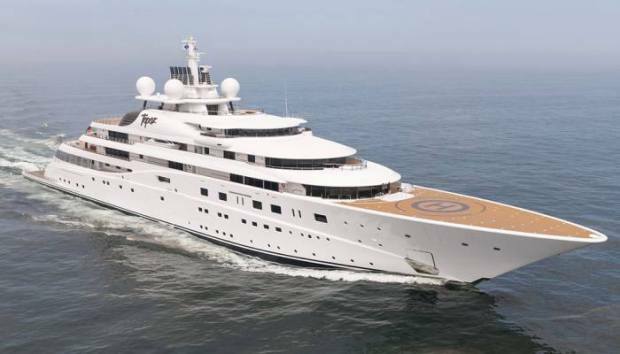 The fifth largest super yacht in the world, the $680 million vessel belongs to billionaire Sheikh Mansour bin Zayed Al Nahyan, the deputy prime minister of the United Arab Emirates and owner of the football team, the Manchester City FC. The imposing yacht, which is docked in Rio de Janeiro, is the creation of British designer Tim Heywood, who has produced some of the world’s finest boats. The majestic yacht is replete with luxurious features that include a top deck jacuzzi, opulent staterooms, a swimming pool, gym, movie theater and a large conference room. While there is no reason to get off the boat at all, if a passenger were in a rush, the yacht is equipped with two helipads, all the better for a quick getaway. The stunning yacht, which is being used by DiCaprio and his 20-odd friends for their World Cup stay, is familiar grounds for the actor. In April this year, DiCaprio teamed up with Hollywood stars Jamie Foxx and Orlando Bloom to host an 80s-themed party on the Topaz, while it was docked in New York. But all these luxuries come at an environmental cost. A super yacht like the Topaz can burn thousands of liters of marine diesel every hour as it cuts an impressive swatch through the ocean waters, leaving behind trails of smoke and tones of carbon dioxide. Additionally, such crafts can use up to 1000 liters a day or more just for its air-conditioning and electrical systems, according to Yacht Carbon Offset, a company that provides carbon offsetting for its seafaring clients. Given DiCaprio’s investment in environmental causes and his presence at the ocean conservation talks, his decision to rent a super yacht in Brazil for partying and football watching, should raise some hackles among his activist colleagues and fans. The enormous carbon footprint of the highly visible Topaz and the celebrity environmental activism of DiCaprio make a potent combination that can be used for stringent criticism of the Hollywood megastar. 22 Responses to "Leonardo DiCaprio Talks Ocean Conservation but Rents Super Yacht to Party"
I am often to running a blog and i actually admire your content. The article has actually peaks my interest. I am going to bookmark your website and preserve checking for brand new information. Great tremendous issues here. I¡¦m very glad to look your post. Thank you so much and i’m looking ahead to touch you. Will you kindly drop me a e-mail?